Have you ever asked why your sister dependably has her mind in another place, painting pictures and taking walk in nature instead of joining and taking part in the neighborhood group event after school? Have any of your family members ever complained that you are too bossy? If questions like these come up in your family, you are not alone. This happens in all families and birth order plays a major role. The order in which you were born does indeed imprint upon your personality. Researchers have been able to identify several unique traits held by first borns, middles, last borns and only children. 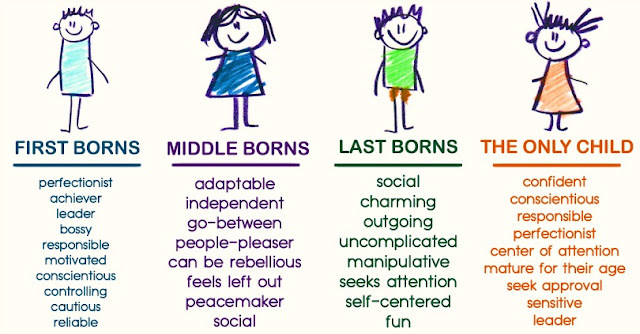 This article will share the qualities that are characteristic to each birth order. How well do these traits reflect those in your family? How Your Birth Order Shapes Your Personality. First borns have a tendency towards perfectionism, being trained by parents who, as new parents, invest anxiously in trying to do everything right for their child. As a result, first born takes this way of being upon themselves. First borns tend to interact well with adults in general when they are kids. Oftentimes, however, first borns can be overly cautious. They tend to worry. They like to be in control over things. They often think they are more competent than others. First born are usually high achievers in all areas – professionally, in school and even in appearances. First borns are diligent workers and like to excel and achieve. Middle children are born into families where there is an already established personality. There is an older sibling already there. At their birth and growing up, there is already one or more senior siblings around that assume responsibility. The parents of middle children are typically more relaxed and less nervous in their parenting with middle kids. Middle children often play off of the behavior of the first born. Unlike first borns, however, middle children usually don’t have a pull towards perfectionism. Instead, middles feel they need to earn their place within the family and seek a way to gain recognition. They tend to be creative in their ways to earn attention. They often feel they don’t get enough attention. They may sometimes be rebellious. Middles typically have great social skills and make good friends. They are adaptive, creative and versatile. The last borns have parents that are considerably more relaxed in their care and attention. The last born often receives and enjoys attention in the form of being called cute. They tend to creatively attempt to find ways to get attention, including getting the sympathy of others. They are natural charmers. Last borns tend to be free spirits. They go with the flow. They like adventure. They are more likely to take risks. They are not very concerned with things such as remembering birthdays, anniversaries, etc. Rather, last borns enjoy life as it comes. Last borns face the unique challenge that what they do is not special. When the first born catches the ball, it is very special to the parents. When the last born catches the ball, it has already been done and is not met with the same enthusiasm as when the first born did it. The only child experiences much of what a first born experiences. This pattern, however, is supported and intensified throughout there lives with no other children for the parents to divide their attention with. The only child is often very comfortable with adults and older people. The result of this can manifest in perfectionism or the need to achieve. They can be very sensitive to criticism. Only children are used to being the center of attention. They often seek approval, focus on details and have a hard time relaxing. These characteristics sometimes interfere with personal happiness in life, even though they are often reap great rewards professionally. The factors that impact these characteristics has little or nothing to do with DNA and everything to do with the relationship between the parents toward the child as well as the siblings toward one another and how this plays out within the family dynamics. Note that when there are large gaps between children, they may take on the role of a first born, rather than a middle or last born. It does not matter what order the adopted child was born of his or her mother, rather, the placement within their adopted family will determine their personality traits. This article was republished from personalitybuzz.com.